Happy Hump-Day friends! Can I just say its currently sunny outside and the snow is melting and I'm just one happy camper! One of my resolutions for the new year was to use less heat and strengthen my hair. I recently tried out HASK's new line of hair product and was very happy with my results in many ways. First off lets talk about their line! It's called the Greek Yogurt Collection and is only sold at Walgreen stores. It contains the obvious Greek yogurt, fruit extract, and is packed with protein, minerals, and calcium. I received their Blueberry and Acai Reparing Collection (Blueberries help restore damage, while acai berry contains essential vitamins that fight breakage); but they also provide Color Protection Pomegranate & Cranberry and Hydrating Fig & Honey! All of which nourish and moisturize your hair look healthy and drop dead gorgeous! 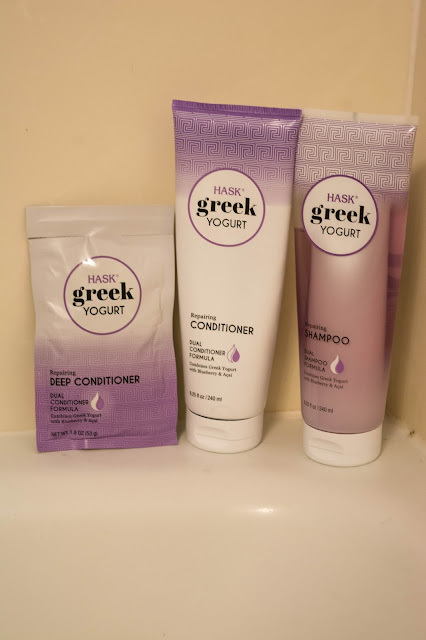 When I tried the repairing collection my eye was quickly caught by the dual chamber which when squeezed it combines the Greek yogurt and the fruit together creating the perfect formula for your hair! While washing, your hair is filled with the aroma of blueberry and instantly starts working. After using both my shampoo, conditioner, and even my deep conditioner, by the first wash my hair had an instant result! My hair was soft, smelt amazing, and felt stronger! 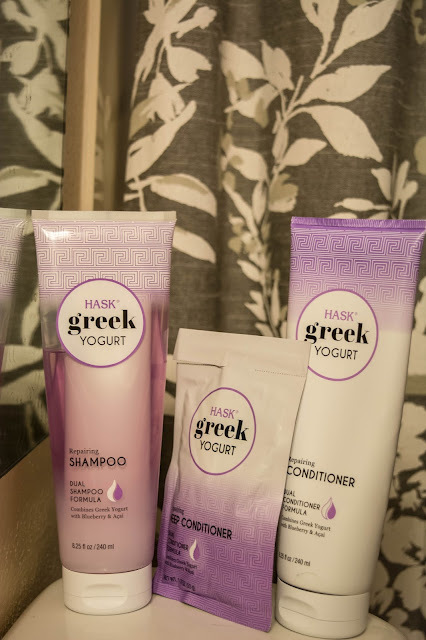 It's hard to find a hair product line that will cause instant results, and I am so excited that HASK new Greek Yogurt Collection has done that for me! The more I use it, the more lasting results I get! If you're looking for fast and long lasting results I highly suggest you drive over to your local Walgreens and pick up their new Greek Yogurt Collection! Your hair will thank you! To get more information on their new line check out the links below! This sounds like it works wonders!